We are involved in research at the interface between the computational sciences and biology. We work on a number of problems and collaborate with experimentalists at every opportunity. Research areas of most interest include computer-aided drug design (CADD), using the Movable Type method to compute free energies, enthalpies and entropies of biological processes, metalloenzymes and metal ion homeostasis, development and application of linear-scaling quantum mechanical methods to biological problems and NMR and X-ray structure refinement using classical and quantum mechanical methods. For further details go to the research section and look over our publications. 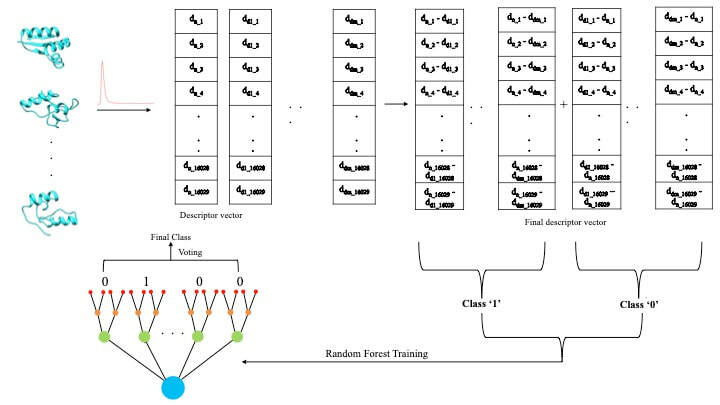 Protocol used to build up the Random Forest model. Comparison of PMF profiles for 12−6 (red) and m12−6−4 (green) Cd2+ion parameters interacting with ethylendiamine.